California was the first state to pass enabling legislation and create its own insurance marketplace following the passage of the Affordable Care Act (ACA). Since then, the state has been a leader in the implementation of the ACA and has reduced the uninsured rate from 17.2 percent in 2012 to 8.1 percent in 2015 while seeing some of the lowest premium rate increases in the country. Though there have been various technical challenges in implementation—and the law itself is complex in ways that reinforce these difficulties—in many ways Covered California is achieving exactly what was expected for exchange-type marketplaces, as they were conceived for 30 years previous to the passage of health care reform. It is a model of “managed competition” that should be a model for health reformers going forward. The state made a decision early on to set up Covered California as an “active purchaser,” allowing it to selectively contract with insurers, negotiate rates, standardize benefits, and require programs that promote delivery system improvement. In addition to the relatively large number of enrollees, which has hovered around 1.4 million, as well as the competitive market for individual insurance in the state, this decision to be more than a listing of services for health insurance company products and their prices has contributed to lower premium increases than almost all other states.The weighted average of marketplace plans is set to increase 13.2 percent for the 2017 plan year, which is well above the averages for the first several years. This one-time bump was expected given the expiration of some of the risk mitigation elements of the Affordable Care Act, and even this comparatively higher rate increase is substantially below the average rate increases in most other states.The expectation was that California would return to modest rate increases in coming plan years as well as aggressively pursue active purchasing policies designed to bring down health care costs and improve the quality of care. But with the move to “repeal and replace” the ACA, the future is now filled with uncertainty. With nearly 40 million residents, California is the largest state in the nation. It is a very diverse state geographically, economically, and demographically. It is also ethnically diverse, with large numbers of African-Americans and Asian-Americans and a Latino population nearing 40 percent of the state’s total residents. California’s 19 rating regions reflect the diversity of the state as well. The Northern Counties region covers a vast geography of 22 rural counties that have significantly more Caucasian residents, while the populous and ethnically diverse Los Angeles County is split into two regions. For the 2017 plan year, 11 insurers are participating in the state’s marketplace. This stands in stark contrast to the limited competition in other states. In both cases, this is a reflection, in part, of the competition in these markets before the passage of the ACA. However, California took some affirmative and successful steps to bring in insurers that had traditionally participated only in the Medicaid managed care market, which will be discussed in detail below. 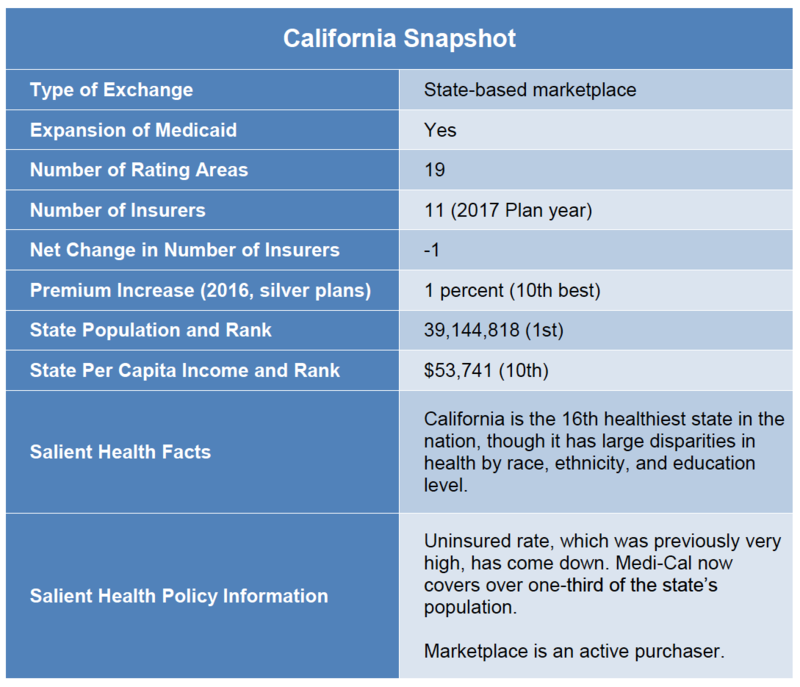 Due to this history and these implementation choices, the majority of consumers in California have access to at least three insurers and those in some regions have access to as many as seven choices. Because of the state’s robust implementation efforts, enrollment in Covered California has been strong. During the first open enrollment period, the state had 1.395 million individuals choose a plan on the marketplace, and subsequent enrollment periods have held steady. Enrollment in Medi-Cal—California’s Medicaid program—also surged, due to robust implementation and outreach efforts. The program now covers over 13.5 million individuals with more than 4 million people being added to the rolls since 2009. 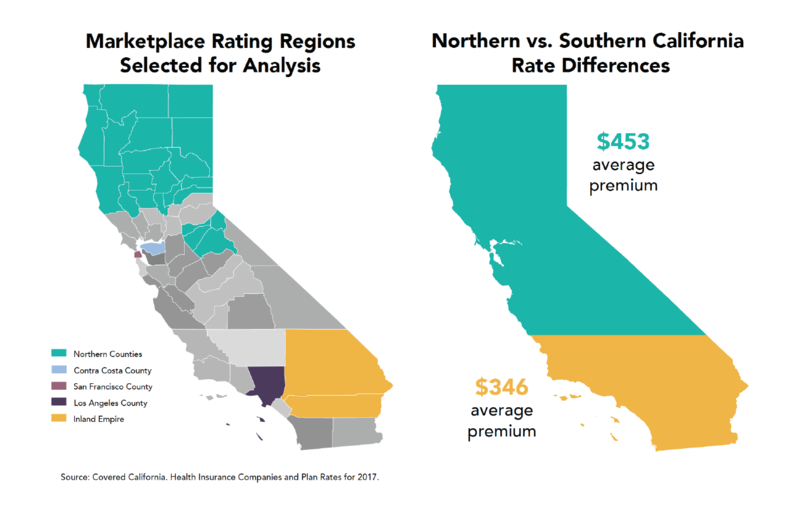 The dominance of a few health care systems in Northern California is a perennial concern and a significant driver of rate differences between regions. Insurers have less leverage for negotiating in regions with fewer hospitals and/or places dominated by large medical groups. As a result, rates are often higher in those areas. High levels of provider concentration are partly responsible for rates being 30 percent higher in Northern California versus Southern California. This report on the implementation of the Affordable Care Act in California will assess the interplay among these factors, the choices that the state made in implementation, the underlying market dynamics, and the extent to which the structure of the federal law all contributed to creating these choices for consumers across the many diverse regions of the state.